Coast-to-coast potential. Young people could have an impact on races in every corner of the nation: from congressional elections in Illinois and California, which appear in the Top 10, to Senate contests in North Dakota and Arizona, to governor’s races in Maine and Alaska. Minnesota on top. Young people are poised to have an extraordinary impact at every level in Minnesota, which ranks first among the gubernatorial races, second in the list of U.S. Senate contests and has four districts in the congressional YESI Top 10. The reasons for this include several highly competitive races, relatively high youth turnout in recent midterm elections and a high proportion of colleges and universities in some districts. For example, Democratic Gov. Mark Dayton’s decision not to seek reelection makes that race highly competitive and will no doubt drive attention to other races, several of which are already predicted to be closely contested. Battlegrounds in play. Several traditional “battleground” states appear throughout the 2018 Top 10 lists, including Colorado, Ohio, Wisconsin and Michigan. For example, in Colorado, which has one congressional district in the Top 10 and comes in third on the list of governor’s races with strong potential for youth electoral impact, young people make up 17 percent of the population. The state also has exceptionally facilitative voting laws, allowing pre-registration for 16-year-olds, automatic voter registration, online registration and same-day registration. In the 2014 midterms, young Coloradans voted at an above-average level of 31 percent. 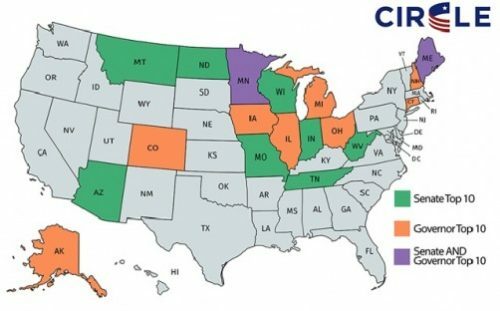 CIRCLE is a nonpartisan, independent, academic research center that studies young people in politics and presents detailed data on young voters in all 50 states. CIRCLE is part of the Jonathan M. Tisch College of Civic Life, the only university-wide college of its kind.